I’m Zhilin Huang, a landscape architecture student studying abroad from China at Texas A&M University. My professor, Donghui Peng, back in China from the Fujian Agriculture and Forestry University (FAFU) is also in here at Texas A&M doing research in Horticulture. He has a green wall experiment program in FAFU. The goal of the program is to build a material company that uses a green wall technique for the exterior wall tiles. Dr. Peng joined a class and counted the survival rate and death rate of plants with us. After that, he gave us some suggestions about how to improve the green walls that we are working on. In my opinion there is a problem with the irrigation system in wall 2 and the shape of the modular is not suitable for adequate root growth. Although many difficulties lay in the way, we can still learn something from the failures and go through them. Despite the hardship we experienced in vertical gardens, there are some good results in the roof garden. The vegetables grew very well and I really enjoyed the time eating the crops we took care of and harvested. Next time we will remove the dead plants and plant some new ones in the green walls. I’m looking forward to doing them. 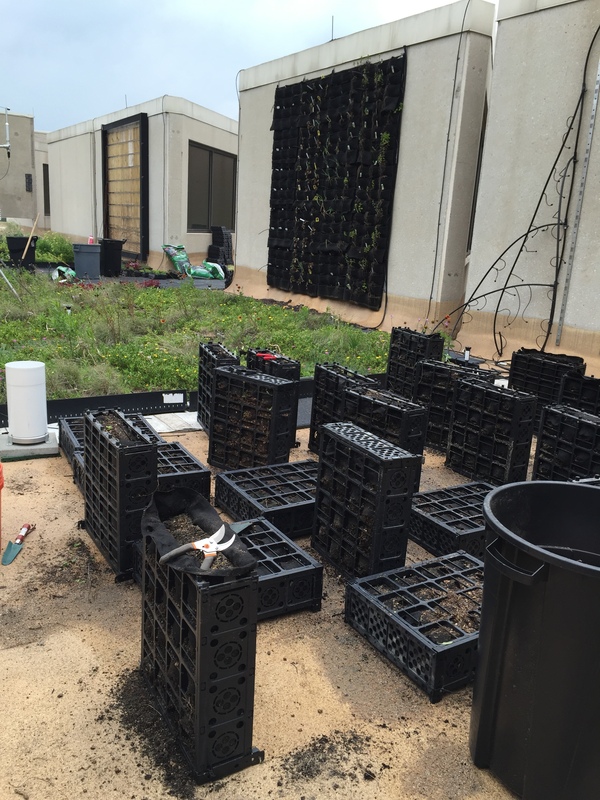 In the last few weeks of the LAND 485 Special Topics green roofs and green walls course, we removed the dead plants from the old modules, and then refilled the soil for those modules. After that, we transplanted the new arriving plants to the modules and then put the modules back to the wall. In this semester, I learned a lot from this course, and I also learned the experiments could take a long time to be tested, applied, and retested. The ideal green roof technology has a large potential market in the future. The green wall technology will be well placed to expand in the Chinese market. In China, there are millions of people living in apartments where the private outdoor gre en space is limited. Those residents are also entitled to the right of enjoying the nature, but it is really hard in the skyscrapers, so most of them place some flowerpots or plantings on their balconies. However, the arrangement of the flowerpots is usually the same and very boring, some people don’t have time to walk into their balconies and cannot take enough care of them. It might because the flowerpots in the balcony are far away from people’s daily activities area and residents in China prefer to use balcony to dry their clothes. Although this may be the common problem, we can still use some simple equipment to build a green wall at home by ourselves. The reason why green walls are going to be popular in China is because green walls can utilize the vertical space instead of horizontal space in people’s homes. So they would like to have green walls in their balconies, either designed by themselves or by the real estate developer. Plants arrive and are unpacked. Plants are inserted into modules and hung on wall. Plants inserted into large module. One of our first tasks this semester was to identify potential plants for replanting two of the modular green wall systems in our experimental setup. Last year, we replanted wall 2, the one with the pockets I dislike so much, and now it is time to select plants for walls 1 & 3. I’ve found that I enjoy the process of researching and identifying potential plants for use in green roof and wall systems, so I wanted to use this space to enumerate some of the more crucial aspects of the process. These include characterizing the site, identifying required plant traits, and then searching for a match. The first step in the process is identifying the microclimate that the wall system will inhabit. In our case, since we are working on walls installed on the exterior of a building, the regional climate plays a large role in this. Many living walls you may see on pinterest or wherever may be inside buildings, and for those, local exterior conditions may not be as important. In our case, however, it is important that the plants are hardy enough to survive in the climate of central Texas. 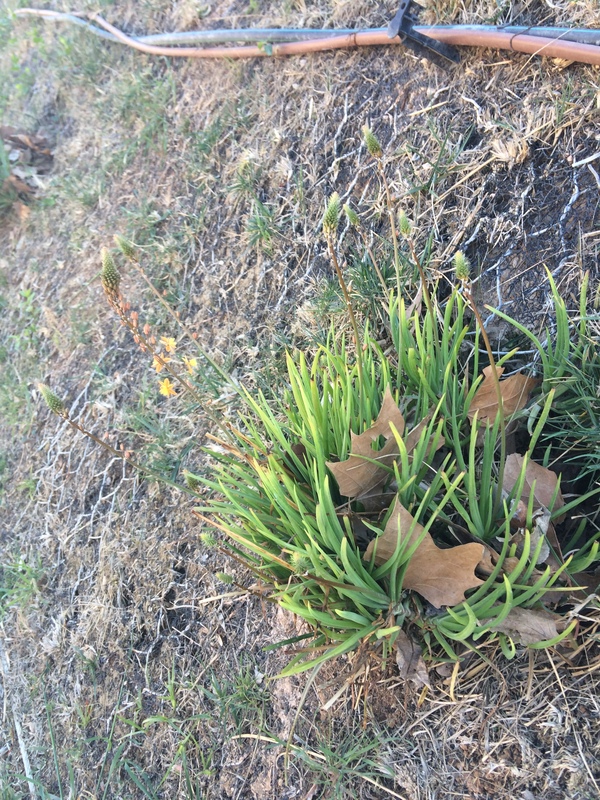 That means USDA Hardiness Zone 8B. Microclimate, of course, implies that there are smaller-scale climactic variables that affect the walls. These include things like sunlight and wind patterns that are affected by the built context of the site. 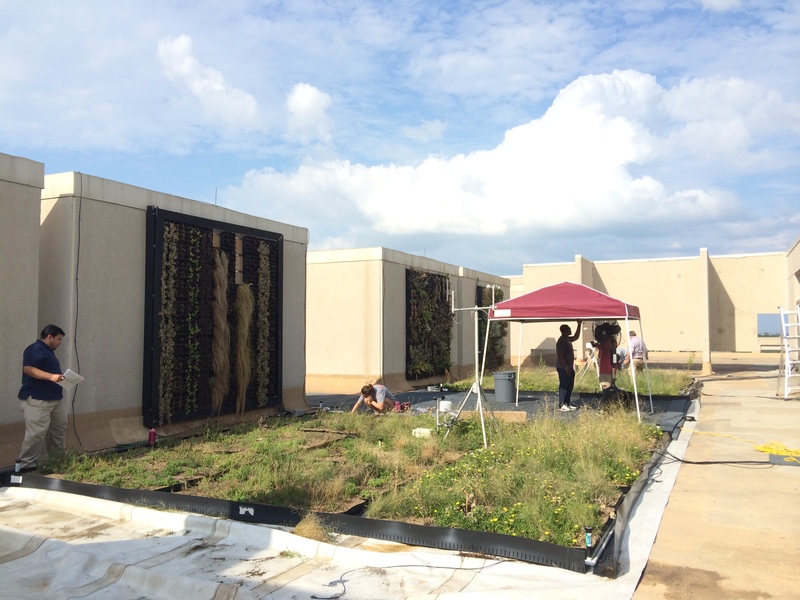 All of our systems are mounted on the south facing walls of a rooftop enclosure on top of the Langford architecture complex here at TAMU. The other walls of the enclosure provide wind shelter for the site, but also affect levels of shade throughout the day. All of these considerations are further refined by the differing designs of the systems themselves. 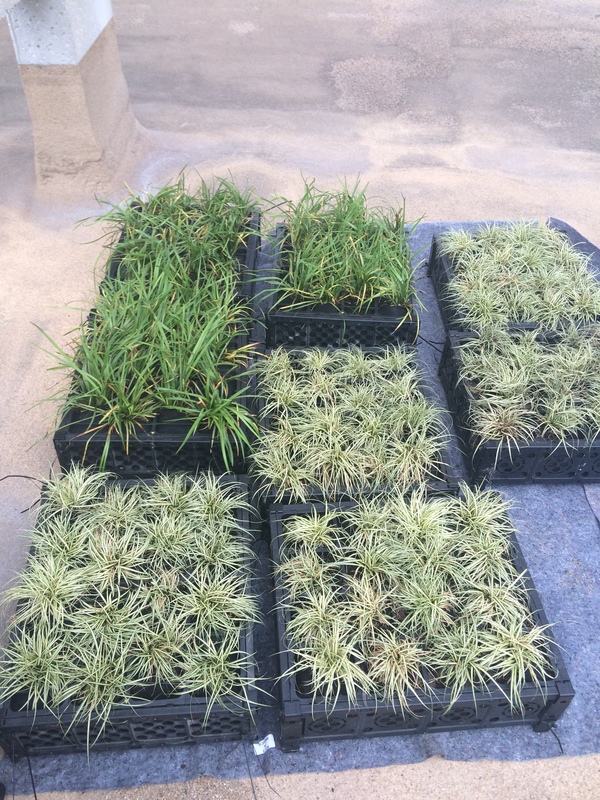 These vary in terms of plant positioning, substrate depth & composition, and irrigation design. For example, Wall 1 uses modules with 8 compartments that project out from the wall at a slight upward angle, maybe 30 degrees. The slots in bottom dividers allow irrigation to trickle down from module to module, and the plants grow at an angle. This would seem optimized for plants that are commonly grown in pots and tend to produce foliage that cascades down. Unfortunately, the slots only go part of the way down the module divider, and the bottoms of the compartments often fail to drain and can get waterlogged. 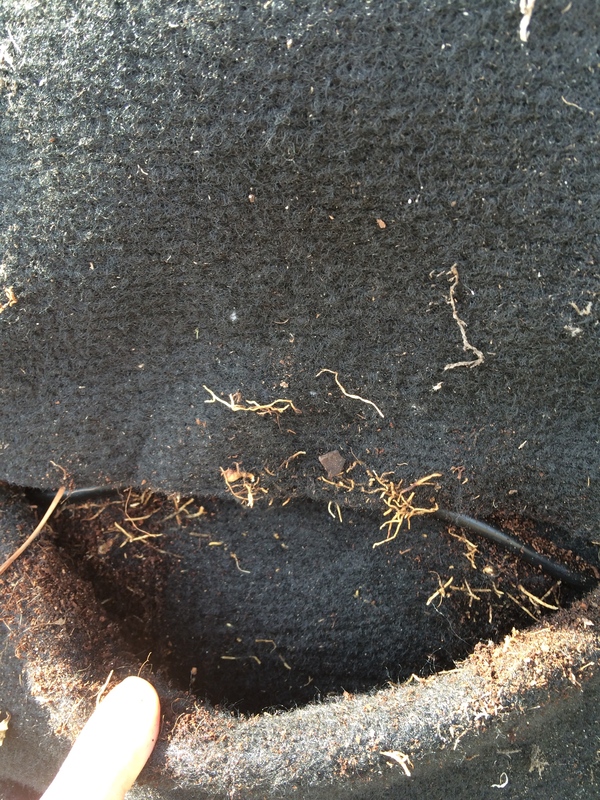 Therefore, moisture tolerant species may be necessary. Wall 3, on the other hand, uses large, boxy modules that each hold one large bag of substrate. There is no angle in this system, and also no dividers within the modules. This provides greater nutrient access for plants, but also allows greater competition among species, and requires they grow straight out from the wall. Having characterized the unique concerns of each system’s microclimate and gained a sense for the constraints that plants will have to cope with, we can develop out some desired trait parameters and go research. I primarily did this using the wildflower.org database that allowed me to sort plants based on criteria. For example, Zone 8, full-sun, perennial, 0-18” tall, and moist-wet soil tolerant. Then one can sort through that entire list for plants that combine those characteristics with aesthetic appeal. Sounds a bit boring, right? It is. What’s more fun is to go out into the community and identify plants already growing in sites with similar microclimates to the roof. This is the ‘go out in nature and find plants growing I those conditions’ method, and I did it constantly on a recent trip to Spain. In Valencia, I encountered several plants in environments that made me think. 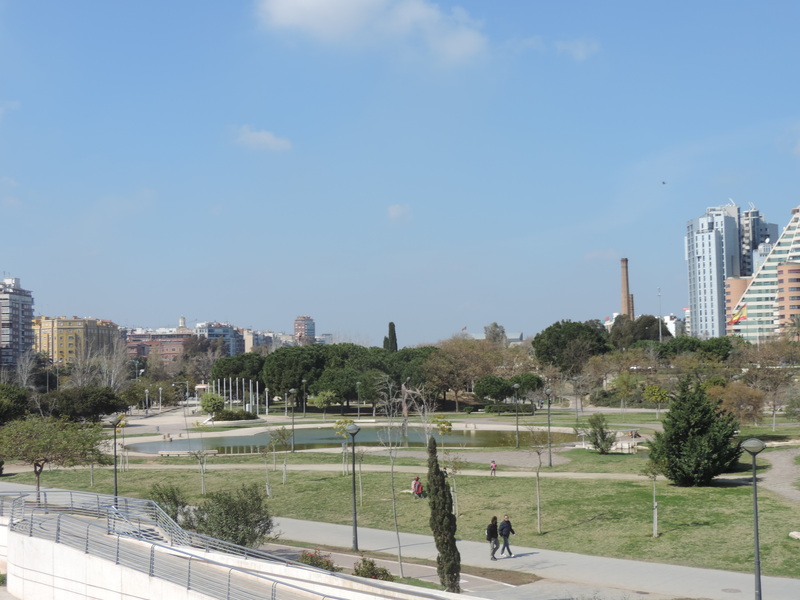 Valencia sits astride the former riverbed of the Turia river, which was diverted mid-century because it kept flooding. 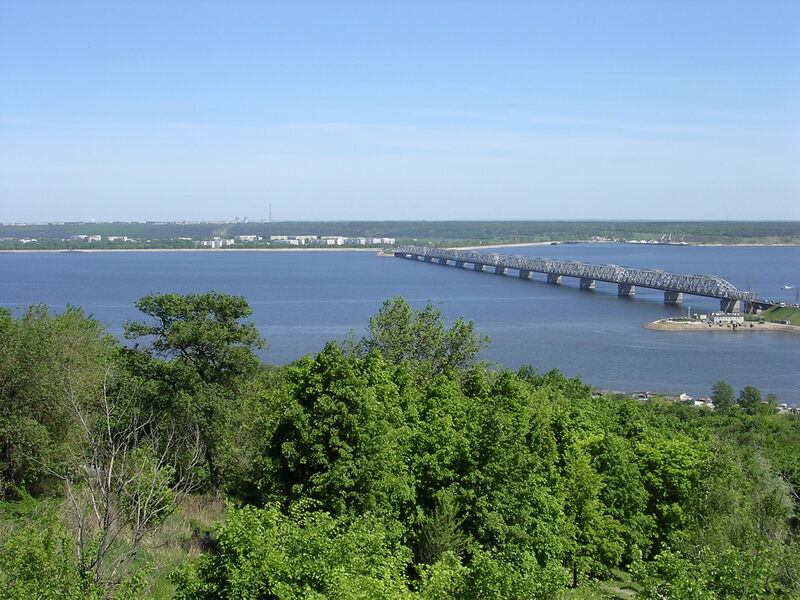 The entire riverbed was converted into a park that basically runs the length of the city. It’s cool. When the entire park is probably 15-20 feet below street level in the city, and as such, the former riverbanks are now large walls that simulate the environment on the roof quite well. The park and street level are connected by long ramps, the sides of which are more intentionally vegetated, but also steep and providing a natural comparison to our site. 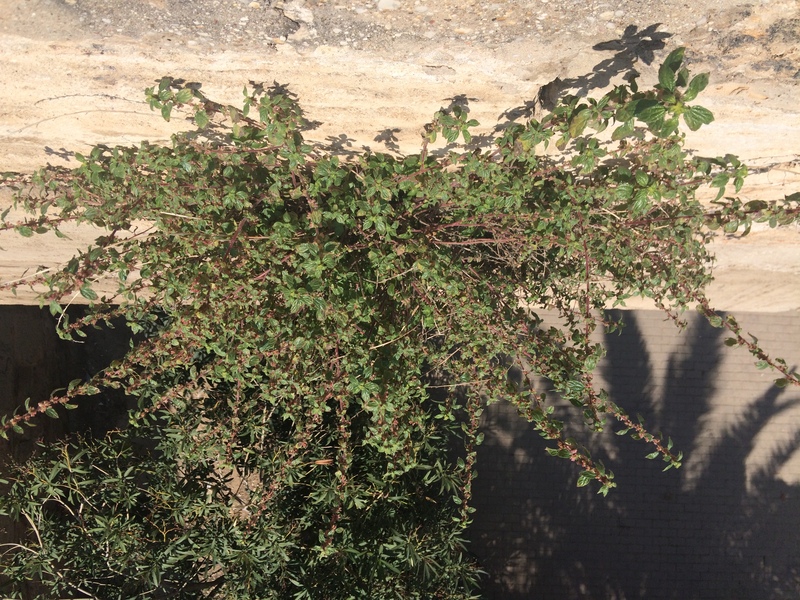 I found numerous plants growing in a crack in the wall or tumbling down the side of an embankment that I thought resembled our wall environments. The first one is growing out of the side of the embankment, the first is just popping out of the side of a bridge. These discoveries not only gave me plant ideas, they also helped me identify useful characteristics I had not considered, and helped refine my search process. Seeing plants growing in nature also sheds light on how people relate to the species, on the subjective experience of interacting with that plant. This is an important consideration, as the human impact of green roofs/walls is just as important as any environmental or resource efficiency benefits they impart. Our focus this month has been on harvesting the winter crops we planted last semester, and identifying our top performers. Plants were harvested continuously over several week period, sorted into marketable and non-market categories, and weighed for biomass. We generated data on establishment, survival, productivity, and marketability % for each crop. I was fortunate enough to be allowed to analyze the data myself, and to present our findings with Nicole Forbes at Texas A&M’s Student Research Week this year. Unfortunately, it turns out that I get maybe a little too into data analysis, and SRW posters only allow for the presentation of so much data, so a lot of the graphs and comparisons I churned out wound up not getting included. Fortunately, I know just where to present the bits I had to omit from the poster. Here. First, I’ll give you a quick and dirty posterview (portmanteau of poster and overview, duh) to relate the general results. From a survival perspective, everything was pretty positive, with the exception of root crops like turnips and beets. Leafy greens and herbs are definitely viable for green roof production. Of those we were able to harvest for this data, Kale, Lettuce, and Parsley were the most productive. What I didn’t get to include, however, was the variation among different strains of these crops, which was considerable. 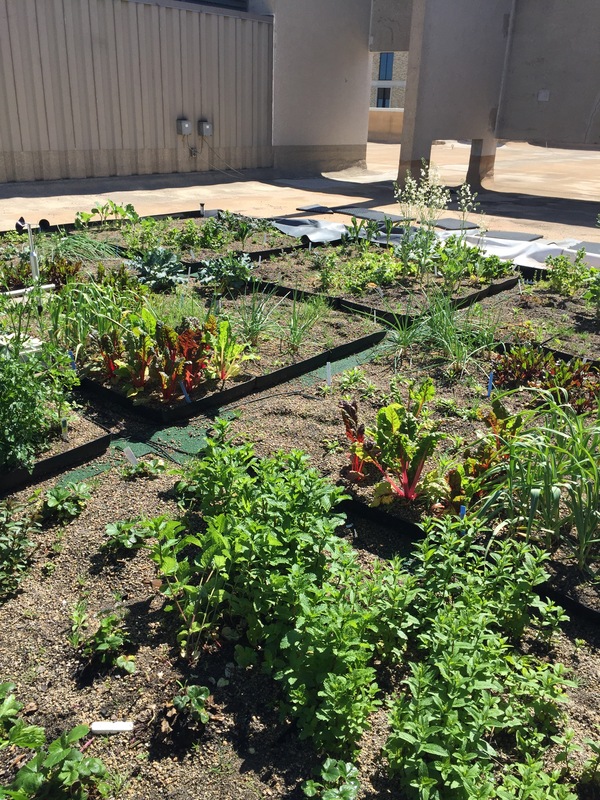 While we looked at the overall crops for their productivity, each of those includes several varieties, each of which produced at different levels and fared differently on the green roof. I can’t be sure why this was the case, but the intracrop productivity splits were apparent enough that I wanted to investigate them. I did so by charting the relative contributions to a crop’s total marketable biomass by each variety, or varietal market share. Lettuce provides a nice starting point, because it displayed a very even varietal split. With only two varieties, it is also the most basic case. 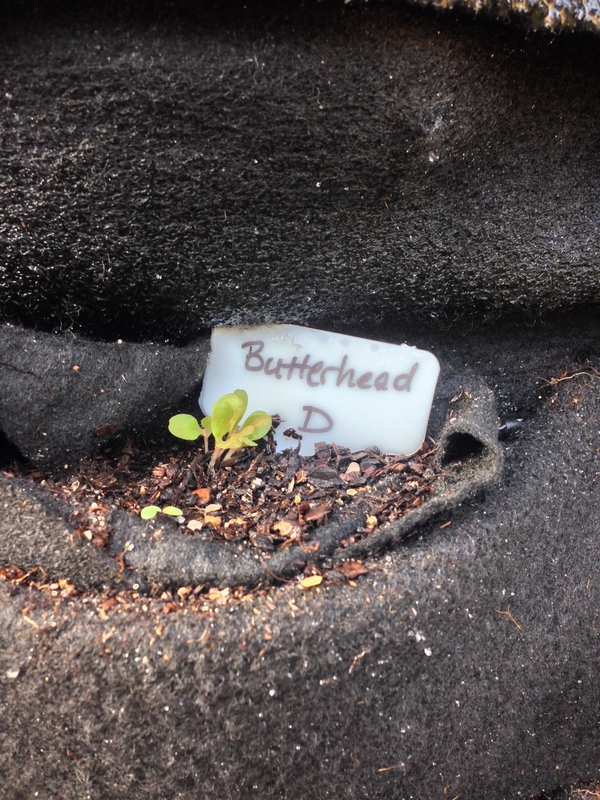 We planted the same number of both Butterhead and Romaine lettuce, and establishment was identical for each. 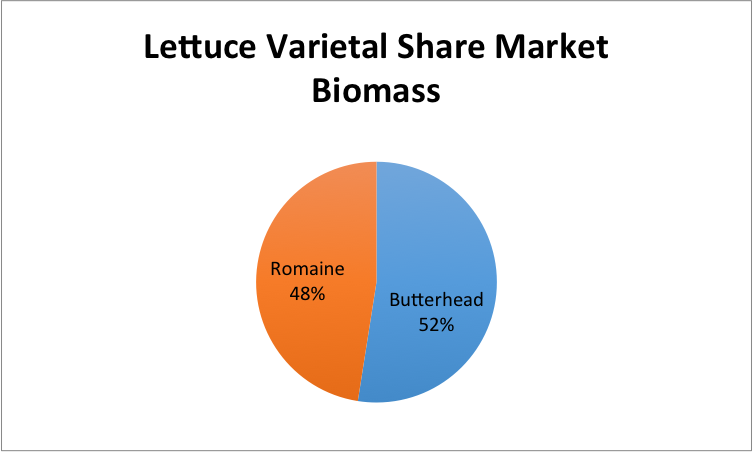 They each produced about the same amount of marketable biomass too, so the split is almost 50/50. This is expected. Parsley exhibited a slightly different share split. 3 parsley varieties were planted, including Italian Plain, Curly Leaf, and Italian Giant. 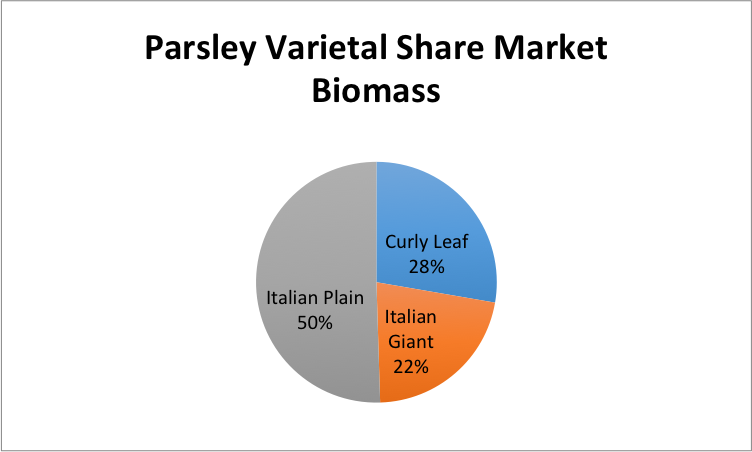 Of these, the Italian plain produced 50% of the marketable biomass, while curly leaf and Italian giant generated 28 and 22 percent, respectively. I don’t have an explanation for this difference, but it is a significant split relative to that seen in lettuce. The Kale is the one I really want to discuss, however, because it has an extreme varietal split. We planted Beira, Toscano, and Red Russian kale varieties. All of them grew and survived at high rates. However, beira kale produced a full 73% of the marketable kale biomass from the roof, while red Russian accounted for only 5. Toscano was 22%. Part of this split is due to differences in leaf size and shape among the varieties. Beira grows wide, large leaves more similar to those of lettuce, while red Russian and toscano produce the long, slender leave you might typically associate with kale. Hence, Beira leaves just account for more biomass. However, the splits were further driven by flaws in the other varieties. 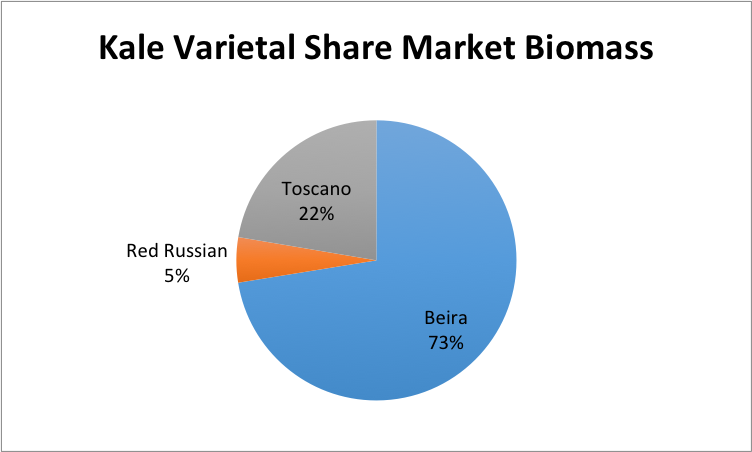 Only 28% of the red Russian was marketable, compared to 73% for beira and 98 for toscano. The reason for most of this was bugs. Red Russian kale leaves that were otherwise perfectly fine had to be rejected due to the loads of aphids they attracted. Aphids that didn’t appear on any other plants on the roof. I have no idea why these bugs seem to love red russian kale alone, but they seriously compromised large proportions of an otherwise fine harvest, and should be accounted for in any future green roof farming projects. 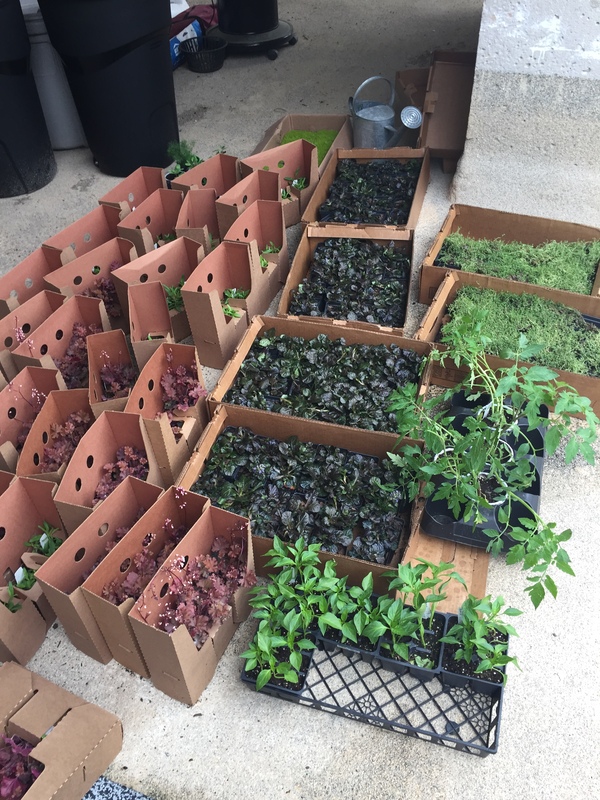 The tail end of the semester has seen the arrival of plants we ordered to replace the walls and winter food crops, and more hands-on work with the systems themselves than we had previously undertaken. That means taking down the systems to install new plants, which has afforded us wonderful insight into the design of the systems and the amount of work that goes in to plant establishment and preparation for a green wall. This experience could prove invaluable as we look to design more efficient systems or expand them in scale, as it provides a look into the technologies and structures that facilitate flows of energy and nutrients in artificial ecosystems. One useful aspect of the experience is the chance to work with multiple wall systems. There are three living walls included in our experimental setup, each with its own unique design and microclimate. I’ve written about these before, but I’ll review anyways. Wall 1 consists of modules angled upwards, out from the wall, that are divided into 8 plant compartments each. These provide a not exactly horizontal growth environment for the plants. The modules for wall 2 consist of 3 rows of 4 felt pockets, each holding one plant. These units are larger, and would be difficult to remove, but allow plant care can be carried out on an individual pocket basis. The soil reserve is vertical, allowing plants to grow more-or-less vertically. Wall 3’s modules are large, rectangular plastic skeletons that hold bags full of growth medium and plants. They are definitely the heaviest module to interact with, and also more difficult to replace the plants for. They also require that plants grow basically horizontally out from the wall. Working on three unique green wall designs side-by-side reveals the relative strengths and weaknesses of each design. Opening them up and pulling them apart allows us to infer the strategies that informed each design decision, and presents a collection of alternatives. The walls have been in use, “functioning” to various degrees, for something like a year or more prior to this replanting, meaning we know which aspects of a given system aren’t performing optimally. Through the replanting process, we’ve been able to see behind the green wall and appreciate the design of the various irrigation systems to a degree not possible when those systems are embedded behind a bunch of plants. We can start to trace the causes of any deficiencies in these systems, and have several alternatives on-hand to compare. Since we took the modules down to replant them, they have largely been left to establish off the walls. This is in part because some systems recommend an establishment period of several weeks prior to hanging the modules on the walls, and in part because plants arrivals are staggered and we need to hang all the modules at once to implement our design. Comparing the systems during establishment sheds light on their effectiveness and how they could be improved, but more than that it highlights an important consideration for sustainable and biophilic design. That is time. It takes considerable time for any natural system to establish and develop. It is important to remember these time-scales when we think about sustainability, whether in terms of projects or in terms of developing sustainability at a social level. The establishment of a green roof or wall is an evolutionary process, and so is the establishment of a green society. We have to let the strong root structures that can support such a society develop and then spread throughout the substrate of our culture before we proclaim it ready to hang up and call done. The diffusion of the ideas and technologies that will drive a sustainable, global human civilization takes time, and we must be understanding of those who lag behind. It is easy to grow discouraged about humanity’s prospects when we see parents and role models ignoring the signs that we must move towards sustainability, carrying on with ecologically profligate lifestyles. But that disappointment stems from the same desire for instant gratification that got us into this mess in the first place. We must start playing the long game ourselves, if we want society to follow us and do the same. If you’ve never seen a green roof, the concept can seem bizarre at first. When I explain green roofs to people, it can take them a while to understand that I am talking about actual vegetation on a rooftop, and not just using green as a stand-in for sustainable. 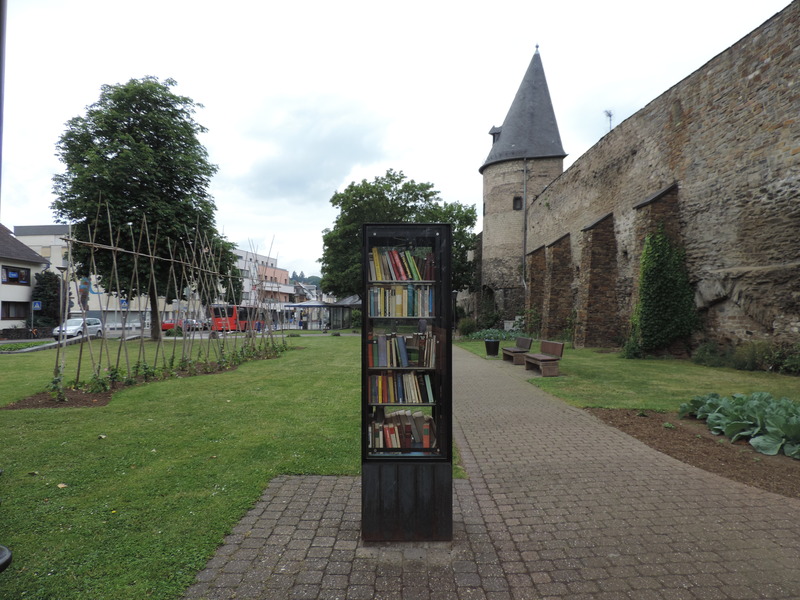 So, for my first blog entry, I thought I would share some photos from my sustainable communities Germany study abroad. Germany is the home of modern green roof technology, and it is there that we can gain an idea of what green roofs look like in practice, rather than theory. 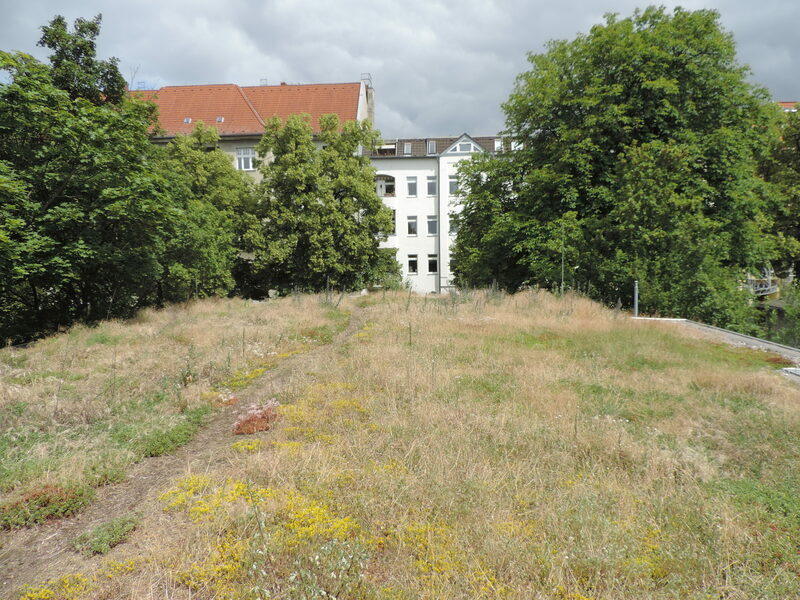 One institution that was important in the development of green roofs in Germany is the ufaFabrik culture center in Berlin. Today’s ufaFabrik developed when young squatters took over the former UFA-Film copy center in 1979 and turned it into a center for developing alternative forms of work and living. UfaFabrik was then the site for various cultural, social, and ecological experiments, “based on the vision of a meaningful integration of the areas of living and working with culture, creativity, and community.” One of these ecological experiments was with green roofs, which now top most of the buildings on the site. These roofs are older than most green roofs you can see today, and provide a glimpse of how they look and age. 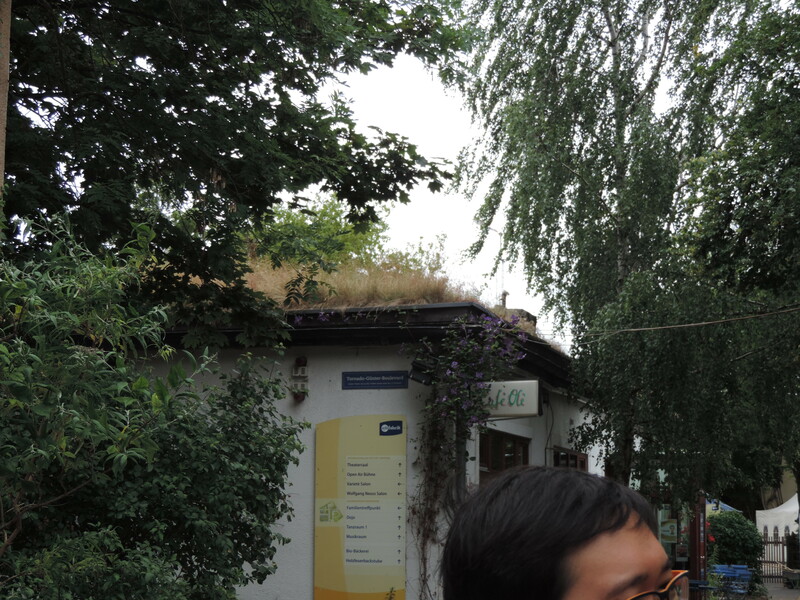 This is a picture of the café at the ufaFabrik, to show you what a green roofed building looks like from the ground. It’s sort of like a normal building, but with hair. Hair that cleans the local atmosphere, moderates local temperatures, reduces stormwater runoff, and lowers energy bills, among other things. Standing on a green roof, you can begin to see how their widespread adoption could increase the amount of functional space on a city. On a sunny day, this roof looks like as nice a place as any to lay in the sun and read a book. Not all green roofs need to be accessible to people, nor flat. The next two photographs show other roofs from ufaFabrik that highlight variations in the technology. As you can see, the roof on the left combines a green roof with a system of solar panels. While the panels would seem to conflict with the goal of growing plants, they in fact provide habitat for shade-tolerant species on the roof, increasing the biodiversity of the system. The energy produced from the panels combined with the savings from the green roof make this building extremely energy efficient. The roof in the right picture is more like what you might imagine installing on your typical American residential home. As you can see, sloped green roofs are possible as well, and not unattractive. 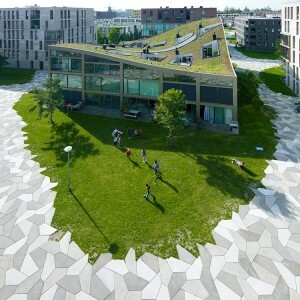 Outside of ufaFabrik, we can see green roof technology applied to a number of different buildings, and consider how the nature of the green roof changes with the use of the building. 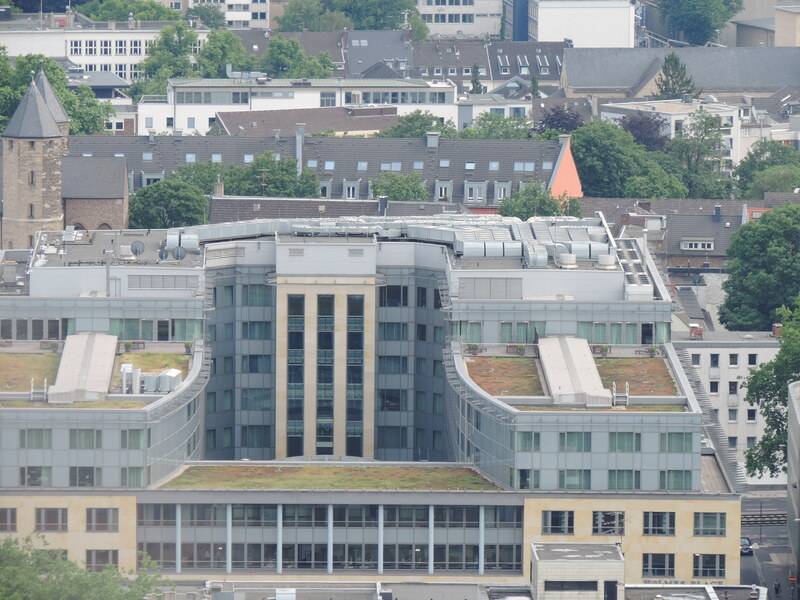 From the bell tower of the cathedral in Cologne, one can see a number of different buildings with green roofs. 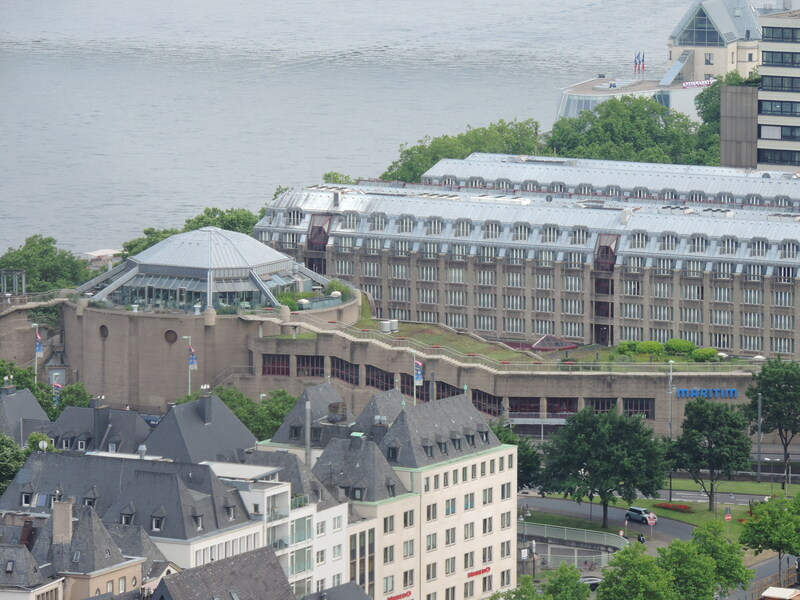 This is a Maritim hotel building on the Rhine. The roof is a simple extensive system, but it does incorporate some ornamentals for hotel guests to look at. This, and the institutional building pictured below, provide an idea of how purely extensive green roofs often used on large facilities look. These are used primarily for their thermal insulation, ecological benefits, and long lifespan. 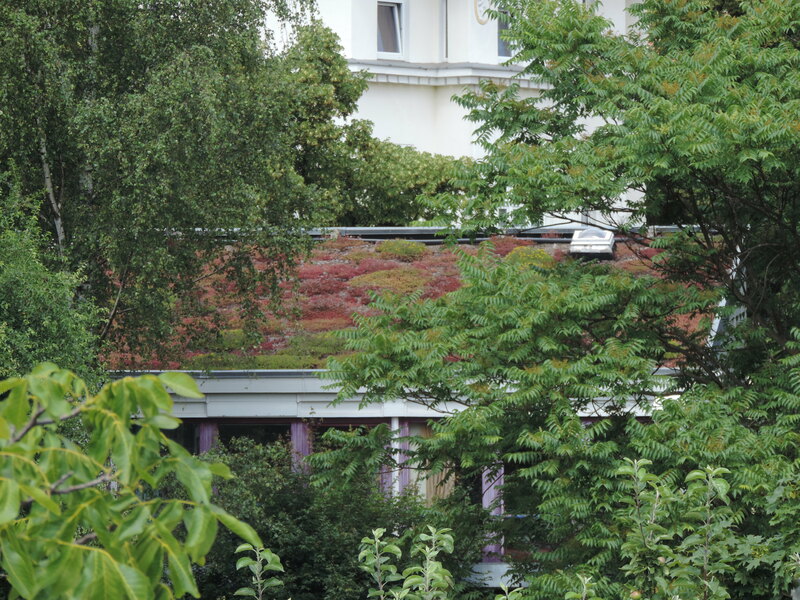 The third roof is in the courtyard of an office building, and, while inaccessible, we can see trees growing on it. Obviously, whoever commissioned this roof is aware that views of green space increase worker productivity and well-being. 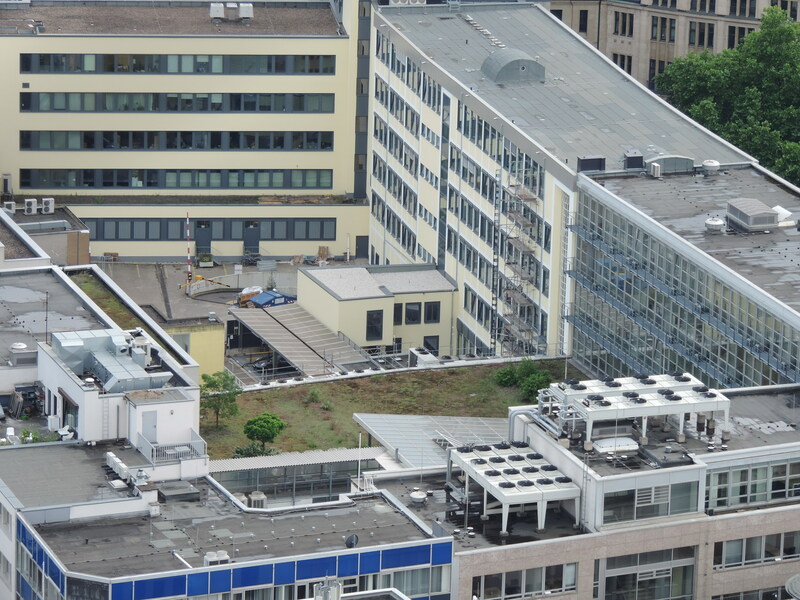 Outside of Germany, I’ve seen other examples of green roofs in action as well. When we visited Amsterdam, we used AirBnB to stay in an apartment located in a central Amsterdam development known as the Funenpark. 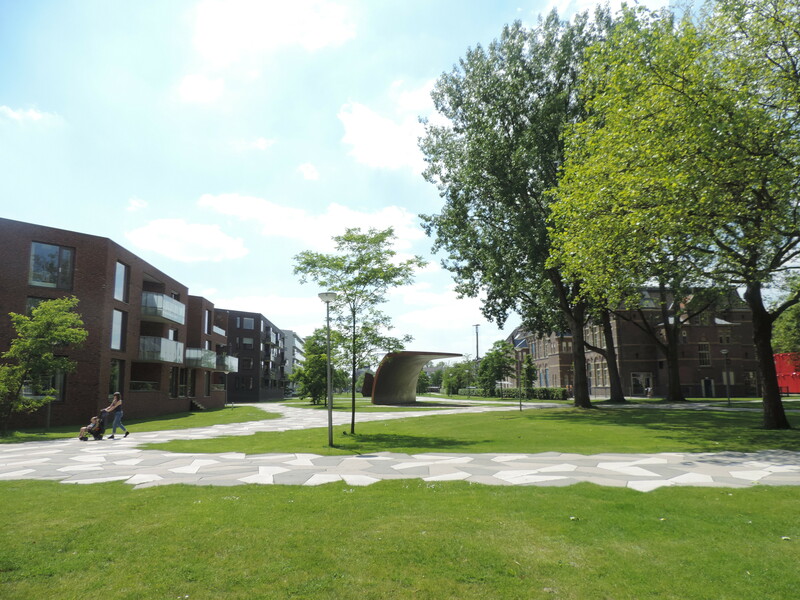 The Funenpark is composed of multi-story apartment buildings surrounding a central, pedestrian-only park. Here is the view from the middle of the Funenpark. The buildings create a noise barrier around the park, such that as soon as you cross into the funenpark the sirens and horns of Amsterdam traffic die away completely, replaced by birdsong and rustling leaves. There’s a school in the middle of the park, and Sundays see residents line picnic tables twenty on end for a community dinner. It is unlike anywhere I have ever been. It gives us an idea of how we can structure livable, green, high-density developments, and of how to incorporate green roofs into apartment buildings. Several of the buildings in the Funenpark feature greenroofs, and like the one pictured here. As you can see, patios from the upper story apartments are cut into the greenroof, allowing those residents access from their apartments. My last example of a green roof in action is a somewhat different application from the others that we have seen. I found it last spring while wandering around Porto, Portugal. From one angle of approach, you can walk on top of it and not even realize you’re standing on a structure. From a different angle, however, it becomes apparent that this seeming park in a square is in fact a small shopping center with a green roof on top. This is one of the things that inspired me to look into green roofs, as it demonstrates how much they can do to improve our cities. 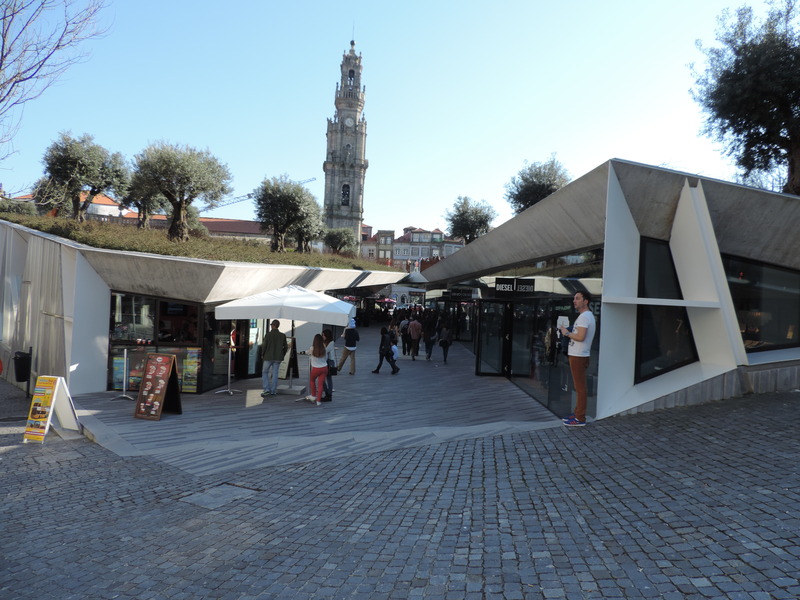 Just by greening the roof, Porto was able to develop this square into both a beautiful greenspace and a functional commercial center. Ultimately, that’s what green roofs are about- not having to choose between enjoying the benefits of development and enjoying the benefits of nature. 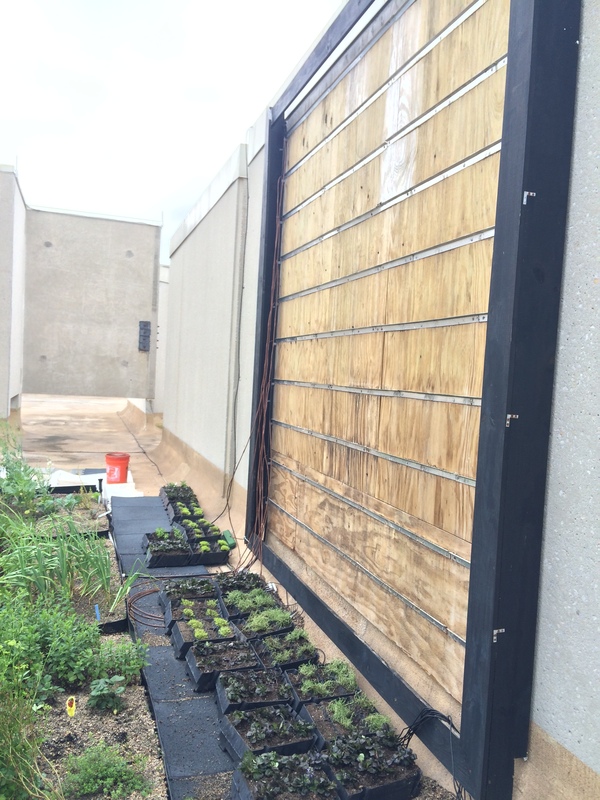 During the past few weeks we’ve planted a variety of food crops on various aspects of our green roof and wall systems. As such, I wanted use this blog entry to talk a little bit about the role green roofs could play in a system of urban food production, as well as highlight the growing importance of the city as a food producer. The United States is a big contributor to food waste, as the USDA reported that 31 % of the nation’s available food supply went uneaten in 2010, good for a loss of 133 billion pounds of food, $161.6 billion, and 1,249 calories per capita per day2. That’s the equivalent of an original sandwich from Chick-fil-A with a large fries, medium coke, and a side of buttermilk ranch sauce, for everyone in America, every day of the year. What might a food producing green roof in the city look like, though? Or better yet, what role could a green roof play as a component in a larger system of urban food production? Looking at Brooklyn Grange, a rooftop farm in New York City, we can see the answer to the first question. The Grange has two farms totaling two and a half acres of space that produce 50,000 lbs. of vegetables each year. This is a good start, but vegetables aren’t enough to feed a city, nor can every roof be converted to an intensive vegetable garden. Thus, to answer the second question, I want to think about other concepts that can complement green roofs in urban agriculture. One is simply converting existing green, public space to agricultural production. 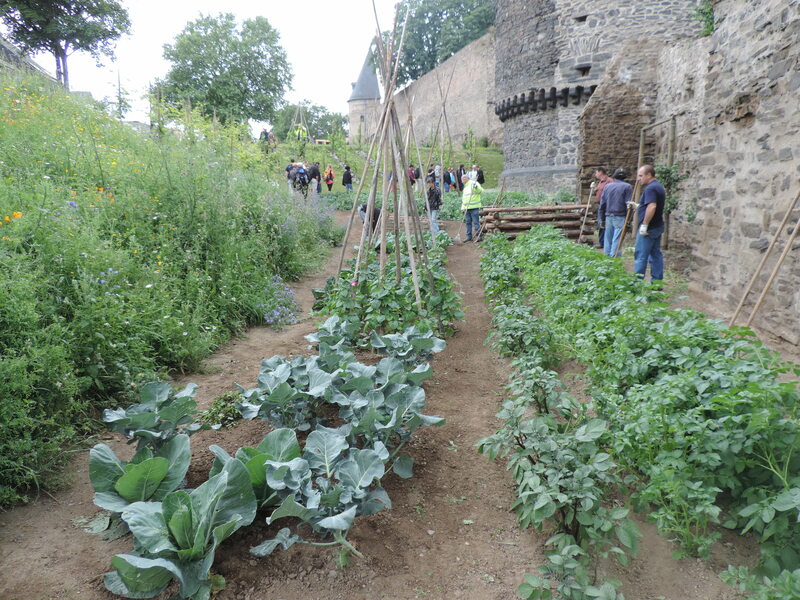 The city of Trier, Germany has undertaken a highly successful experiment in this field, creating what it calls an Edible City. 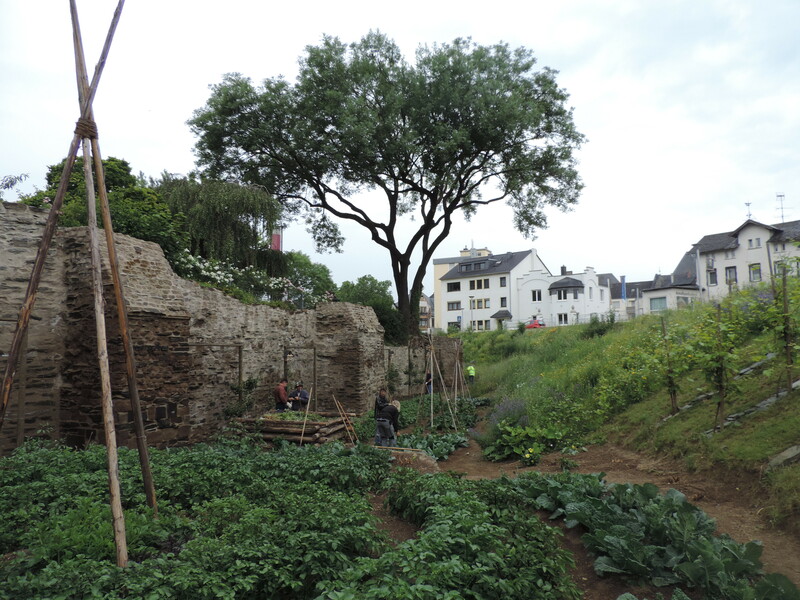 The castle in the center of town is a large public space surrounded by parks, and now much of this park is devoted to producing food free to the public, including vegetables, herbs, and chickens. While there were concerns going in about vandalism and over-use by the public, but these were simply never borne out. 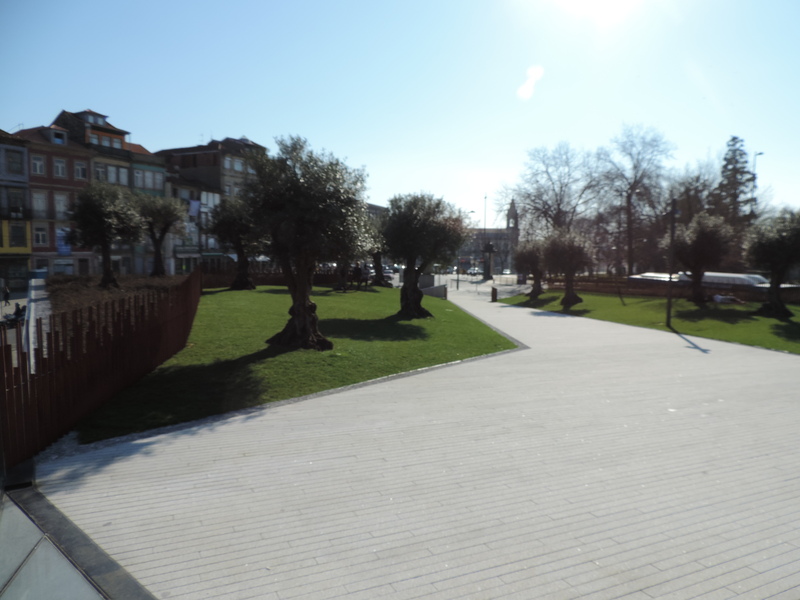 People seem to respect this use of public space, and the project has increased in popularity every year. The crops are tended by formerly homeless or long-term unemployed individuals who use the program to develop employment skills and find work, which the majority of program participants had done when we visited. You can see how Trier looks below. This public production of food could do a lot to reduce food wastage by increasing respect for and awareness of food production in individuals who would normally never think twice about where or how their food is produced. 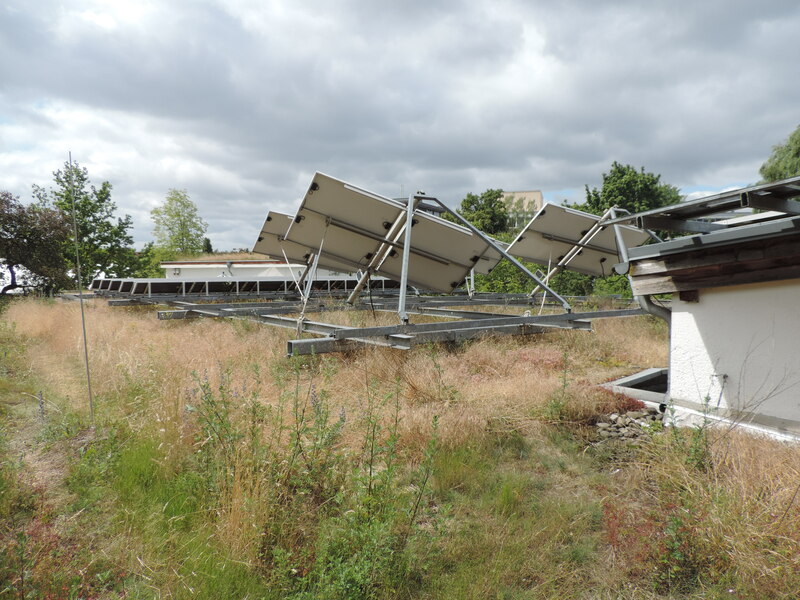 There are also novel technologies that could be paired with green roofs for food production. Aquaponics is a form of production that grows both produce and fish. While it requires a green house, thus precluding its use in the same structure as a green roof, it produces large quantities of fish and produce with limited inputs. The fish provide fertilizer and carbon dioxide for the plants, while the plants provide nutrients and oxygen for the fish. A green roof built for farming could incorporate similar water recycling mechanisms to reduce the inputs needed. 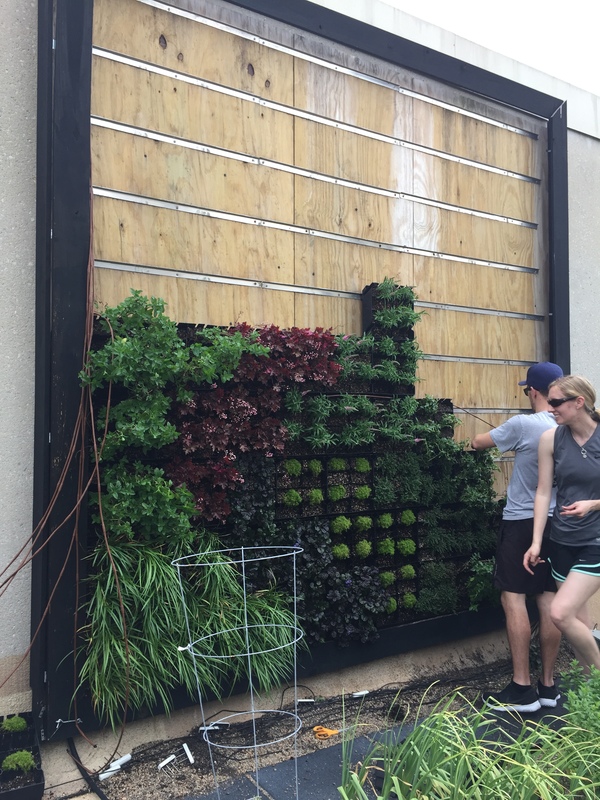 Regardless, aquaponics, vertical gardening, keyhole gardening, green roofs, and other new systems could combine some day to produce a meaningful amount of food within the city. In addition to farming produce on a green roof, there is no reason why simple extensive systems couldn’t be used to raise livestock. While large animals obviously present challenges, green roofs seem like ideal environments to raise smaller stock like chickens. 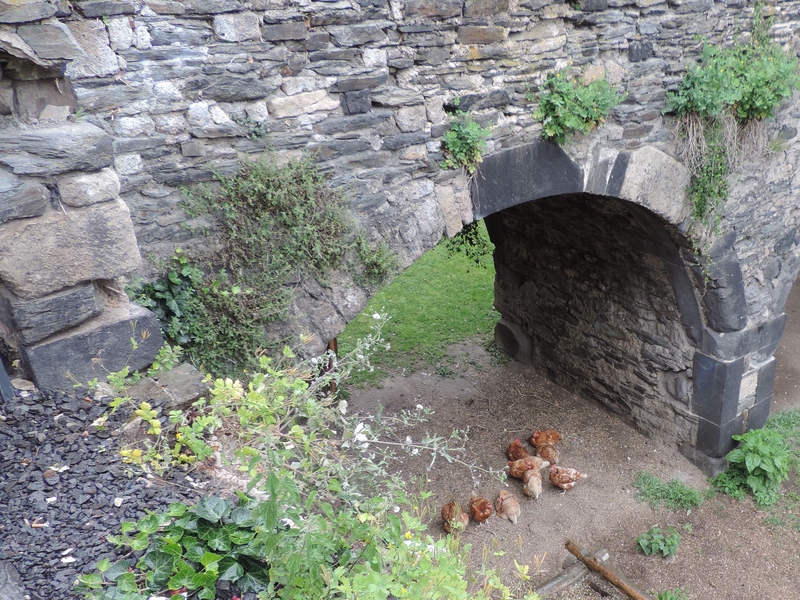 Lay-hens on such a roof could produce free-range, all natural eggs in the city, and converting rooftops to small scale meat production could lessen our reliance on industrial scale meat production with all of its environmental and ethical concerns. 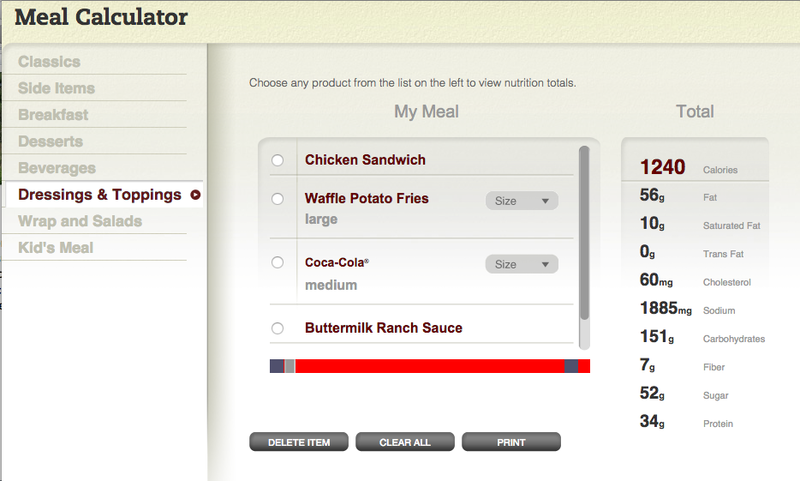 This is probably just the organic chicken farmer in me, but I think it’s possible. There are, of course, other technologies and forms of production that could complement green roofs means of producing food in cities. Many of these are focused on producing as much food as possible in as little horizontal space as possible, which is obviously an objective of urban agriculture. Where green roofs present a novel opportunity is in converting existing nonfunctional space into productive space. Together, these technologies could reinvent our cities as leading centers of innovative, sustainable food production. This month we focused primarily on keeping track of how the various food crops we have planted have done on the roof and wall systems we cultivated. Given that this is an experimental planting, we do not expect every species to be successful. Hopefully we can ascertain which species will be viable for green roof production in the future from this planting. 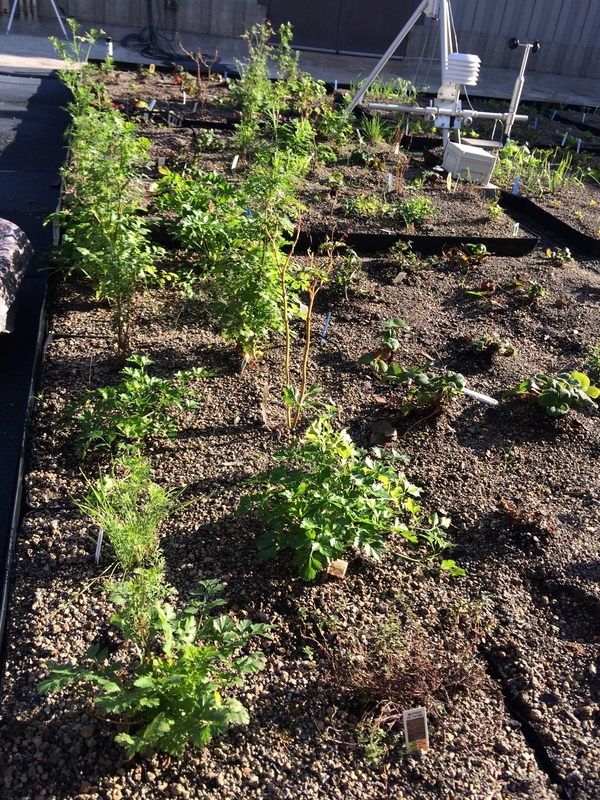 As such, I wanted to share my impressions of how the crops we’ve planted on the green roof and living wall have done thus far as we come to the end of the semester. As you can see, there has been substantial growth, and to our excitement it looks like some plants are doing quite well. The best performers are the herbs: parsley, cilantro, thyme, and chives. The strawberries and mint are a different story. While the majority of both crops are still alive, they seem to be struggling and just don’t look as happy as the herbs. From seed, we planted the green roof with lettuce, kale, arugula, spinach, garlic, radishes, turnips, shallots, and perhaps a couple others. Most of these are doing fairly well, with the exception of the turnips and perhaps radishes. 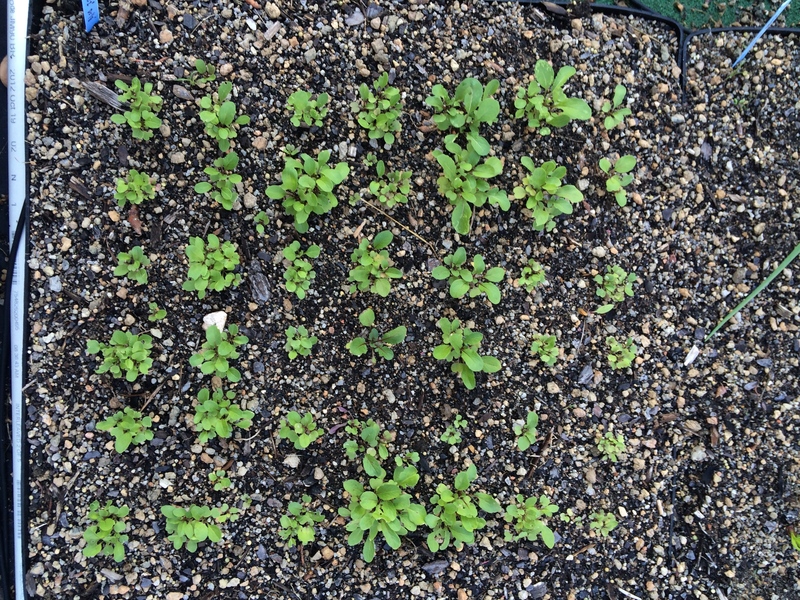 All of the seeds planted have germinated into seedlings in a majority of the modules, as seen in the kale and arugula modules pictured below. 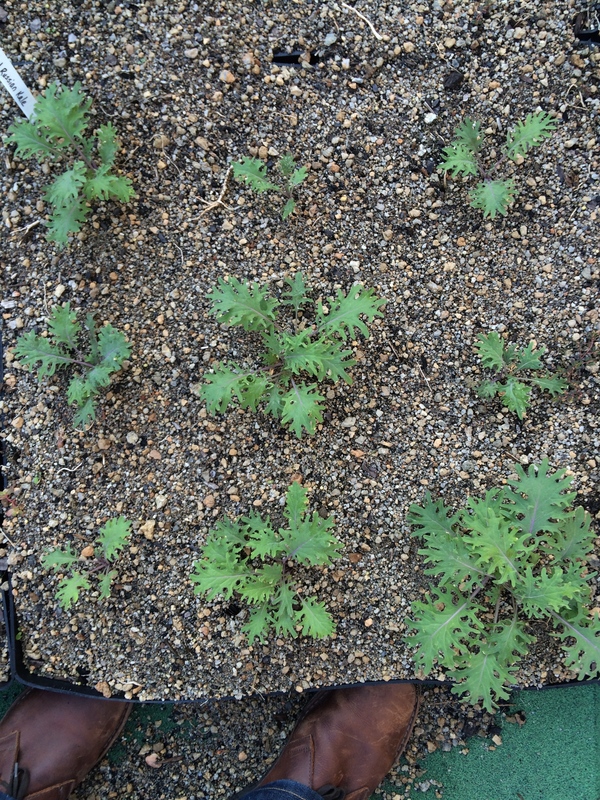 There are some differences between varietals as well, as the Beira Kale we planted has fallen prey to some critter that has no interest in the Red Russian Kale pictured above. There is also variation in health among species and varietals across the modules. This seems due to sun/shade discrepancies resulting from all the walls surrounding the roof. Generally, the more southerly modules look less vibrant than others. Given how early in their life cycle it is for many of these crops, it is too early to determine which will produce the best, but overall I am excited with the results thus far. The living wall we planted primarily with transplants, with some direct seeding to compare. The species included are strawberry, mint, lettuce, collards, garlic, shallots, and some random ones we had left over. Below you can see a picture of the wall midway through planting. This system is designed so that each plant has its own pouch of soil, which is then inserted into a pocket on the wall. The plants are confined to their pouches, which are watered by dip irrigation. As I see it, this design poses several problems, which is probably why the plants on this wall do not look great today. First, the pocket system puts a lot of stress on the plants. Since the pockets are directly under one another, and not offset, irrigation from the drip system seldom affects more than the row directly underneath it. I pulled many dry pockets off the wall when we were preparing to plant. Furthermore, the pockets contain a limited amount of soil for the plants to grow in, restricting their capacity for growth. Finally, each pocket has a skirt, and this often interferes with sunlight reaching the plant in the pocket below. I had to pull several plants out from behind the skirt and back into the sun during our species count. Below, you can see an example of a pocket, with the irrigation line and the skirt from the pocket above it. For now, many of the plants on the wall are still alive, but few are doing great. The mint and strawberries look to be struggling, while it’s hard to tell on the lettuce transplants. Nothing seems to have grown much since being up there. Flaws in the roof system aside, it will be interesting to see how the plants turn out in the spring. 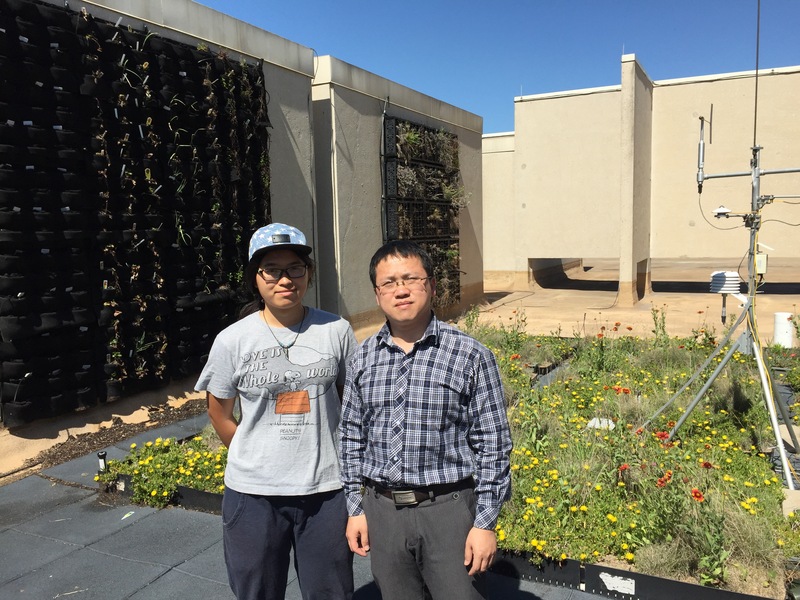 Hopefully, we can demonstrate that food can be grown on walls as well as roofs. 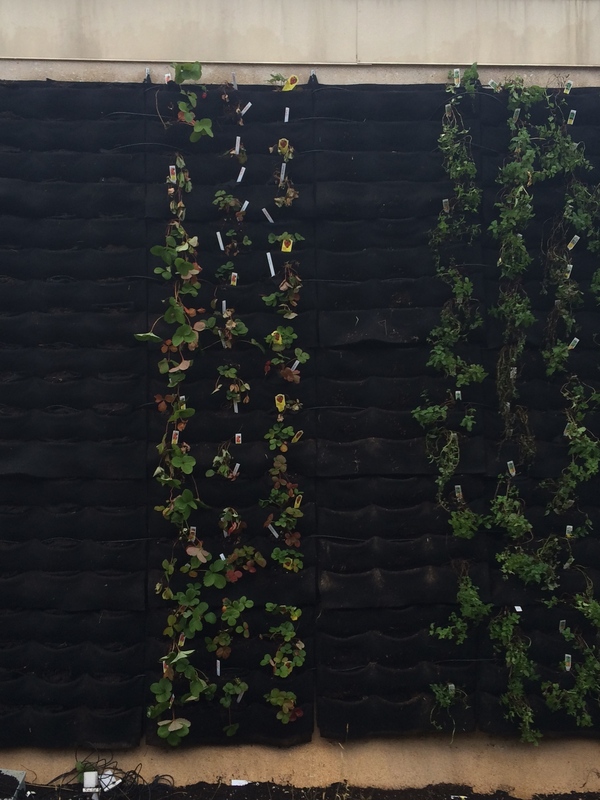 Since the use of fruit and vegetable crops on one of the green roofs seemed like a good idea, my classmates and I also thought it would be interesting to see how such crops would perform on a living wall. As with the green roof, various types and varieties of crops were used, as well as different growing techniques. Due to the living wall system consisting of pockets, all transplanted plants had to be wrapped in cloths and then inserted into each pocket. For plants that were directly seeded, we prepared pockets of soil in advance and then inserted the seeds by hand. Unlike the green roof that was planted prior to this, a few of the plants on the wall do not seem to show much promise and water intake appears to be an issue. Weekly observations have indicated a slight decline in many of the plant species we selected, particularly some varieties of mint. Should these conditions continue, it is likely that many of the plants will have to be replaced. However, since these projects are primarily for research purposes, any results or data collected are helpful in understanding how these systems work and how our current methods and techniques can be improved. After collecting all the inventory data that was needed, my classmates and I spent a couple weeks rearranging plant modules and removing any unwanted plants from them. Once we had removed all plants from the unsatisfactory modules, we began brainstorming ideas for what kinds of plants could be used as replacements. 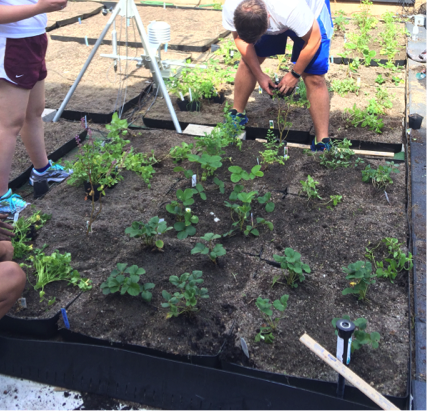 The consensus was that we would be experimenting with vegetable and fruit crops to determine whether or not they would thrive and adapt on a rooftop setting. 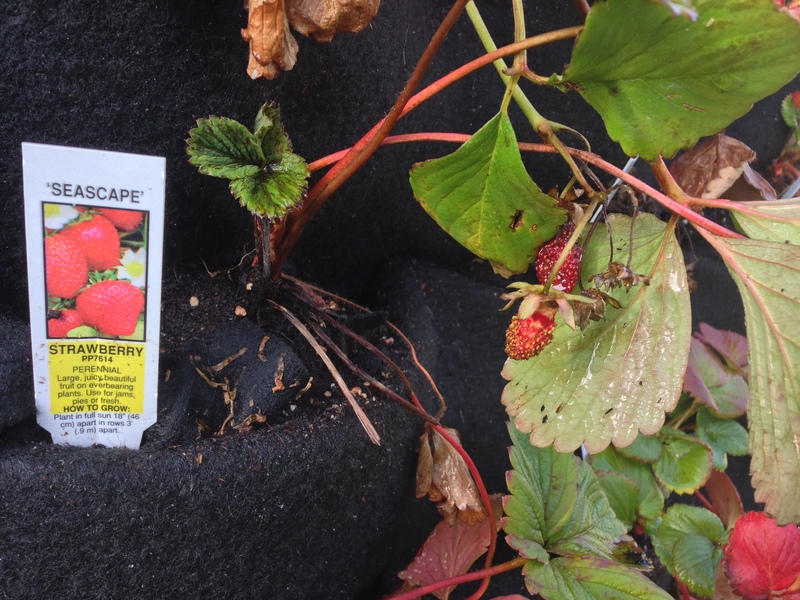 Some of the crops we chose to work with included different varieties of strawberries, lettuce, kale, and garlic. Many of these crops were selected for their hardiness, but some were chosen for the sake of experimentation. While some of the plants were simply transplanted, others were directly seeded. This was done to determine which method would yield better results. Weekly observations have indicated that both methods are successful and many of the plants have begun to show promise. If these results continue, we may actually be able to harvest some of the crops within the next couple of months or so.